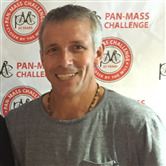 This year I will be riding in my 4th Pan-Mass Challenge! I am excited to be riding again for the Patriot Platelet Pedalers. This group raises funds specifically for the Jerome Lipper Multiple Myeloma Center and the LeBow Institute for Myeloma Therapeutics at Dana Faber Cancer Institute. It's nice to know exactly what the donations are supporting, and each year the riders are given an update on the amazing work that this group does. In the last 2-3 years alone they are responsible for 7 new life-saving therapies and are currently developing promising immunotherapies. Each year I also look forward to completing this ride with my good friends. Each of us has been affected by cancer in some way. I am inspired by the progress being made and I can not wait to ride again in support of this amazing organization. With your help, there will be a cure! Every donation brings us closer by the mile. Please consider a tax-deductible donation to support my ride and this incredible center.